Q: What are the latest fad diets clients will ask about in 2019? A: Just about every year, one of the top New Year's resolutions is to lose weight. So as soon as January 1 comes around, many Americans rush to try the latest fad diets promising quick fixes. While many fad diets proliferate, three that clients may ask about are the Dubrow Diet, the Anti-Inflammatory Diet, and the Snake Diet. 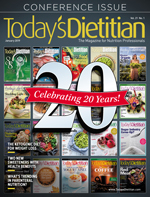 Today's Dietitian discusses the basics about these diets and provides a quick and simple scientific debunk. This program was created by Heather Dubrow, a former star of Bravo's TV show The Real Housewives of Orange County, and her husband, Terry Dubrow, MD, a plastic surgeon and star of E! 's TV series Botched. The creators claim that the diet is based on cutting-edge science that promises metabolic control, including weight loss, along with internal cellular rejuvenation with powerful antiaging effects. The diet is a form of intermittent fasting, dubbed by the creators as interval eating, where you limit consumption of food to a 12-, 14-, or 16-hour window. Three phases of the diet include Red Carpet Ready (quick start phase), Summer Is Coming (weight loss phase), and Look Hot While Living Like a Human (weight maintenance phase). There's no calorie counting, only time-restricted fasting. The focus is on high-quality foods including high-fiber carbohydrates, lean protein, fruit, and vegetables. One glass of wine is allowed daily. The plan also emphasizes the importance of advanced planning, eating healthful food, and eating for energy. However, it also promotes a low calorie intake (about 1,000 to 1,200 kcal/day) and emphasizes body image (as seen in the phase titles). Quick debunk: The effects of intermittent fasting still are being studied. A 2015 review of both animal and human studies on intermittent fasting concluded that there are limited human studies regarding the positive impact on weight or metabolic health.1 In addition, data are lacking regarding its impact on health behaviors such as diet, sleep, and physical activity. The theory behind this diet is that chronic inflammation leads to chronic disease. By reducing inflammation, one can prevent age-related disease, promote overall wellness, and lose weight. There are numerous versions of the diet, with Dr. Weil's (Andrew Weil, MD) being one of the more popular versions. Many versions, including Weil's, are based on the Mediterranean diet, which emphasizes healthful foods such as fresh fruits and vegetables, healthful carbs (eg, whole grains), omega-3s, and dark chocolate, and avoidance of fast and fried food. However, the allowable vs prohibited foods within these groups can become overwhelming. For example, certain fruits and vegetables are to be avoided if they're not organic. In addition, the diet recommends a long list of supplements, which may be unnecessary or interact with certain medications and/or medical conditions. Quick debunk: There are some healthful aspects of this plan, but some of the rules are complicated and unnecessary, which can ultimately lead to diet failure and emotional stress for those that follow it. This diet has the consumer mimic the eating patterns of a snake by eating for one to two hours a day while fasting the remaining 22 hours. The theory behind this diet is that humans adapt and evolve to an environment where food is scarce, which will result in fat loss. During fasting periods, the only food consumed is Snake Juice, which consists of water, potassium chloride (no salt), Himalayan pink salt, baking soda, and food-grade Epsom salt. Quick debunk: Fasting for 22 hours is extreme, and if done over a prolonged period of time can result in nutrient deficiencies. Consuming Snake Juice will produce the same result, as it's grossly inadequate to meet the body's needs during fasting periods—not to mention its unpalatable flavor. In addition, side effects such as headaches, constipation, lethargy, and crankiness likely will result from not eating enough food. The body can't obtain the optimal number of nutrients needed to stay healthy in a one- to two-hour period of time every day. 1. Patterson, RE, Laughlin GA, LaCroix AZ, et al. Intermittent fasting and human metabolic health. J Acad Nutr Diet. 2015;115(8):1203-1212.